Bat in Your Home: Good or Bad? Home / Modern Pest Blog / Bats: Menacing or Misunderstood? Bats: bloodsucking monsters or harmless creatures of the night? For many of us, picturing a bat is enough to send a chill down your spine. In medieval folklore, bats were associated with villainous vampires and wicked witches, and that reputation has stuck with them for hundreds of years. It has become more ingrained by their representation in pop culture, and even one of DC Comics’ most popular superheroes uses the imagery of bats to intimidate his foes. But do bats deserve their dangerous reputation, or are they just one of nature’s misunderstood mammals? There are over 1,300 species of bats worldwide, and they all play a vital role in their natural ecosystems. In fact, they have often been considered an essential “keystone” as without them many local ecosystems could gradually collapse! Bats assist in pollinating crops, reducing the number of disease-spreading insects, and dispersing seeds that help to restore cleared rainforests. Without these small flying mammals, the world we live in would be a much different place. Got Bats? Modern has the solution – GUARANTEED! Learn more about our humane Wildlife Exclusion program! In New England, the role of the bat is primarily that of insect control. Bats are the only major predator of most night-flying insects, and a single bat can consume nearly 3,000 insects every night! The two most common species in the northeastern United States, the little brown bat, and the big brown bat can significantly reduce the population of mosquitoes, moths, and agricultural pests. What about the sinister side of bats portrayed on TV? If visions of vampire bats are keeping you awake at night, never fear: New England is home to 9 species of bats, and all of them feed solely on insects. In fact, there are only three species of vampire bats in the world, and they all reside outside of the United States. Also, these species prefer livestock blood to that of humans. The fear of bats could likely be attributed to a lack of knowledge and enduring myths about them. Bats do not attack people. If you are outside at night, it could be possible to have a bat seem to swoop towards you. This is because our bodies attract insects, and the bat is merely looking for a meal. They will not try to become tangled in your hair and are not aggressive. Usually, if someone is bitten or scratched it is because the bat was acting in self-defense. For the most part, they remain in the shadows helping to sustain life on our planet while most other mammals sleep. Most people will have very few if any, direct interactions with them. Health risks associated with bats are infrequent but are possible, therefore proceeding with caution is still recommended. Thankfully, being aware of the risks can help prevent bats from ever posing any real danger to you or your family! A common myth about bats is that they all transmit rabies. 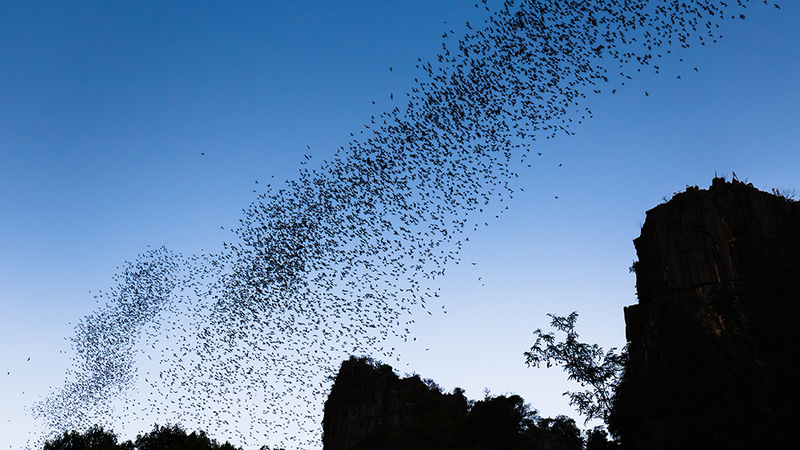 Like all other mammals, bats do have the potential to contract and carry the virus. However, according to the National Park Service, less than 0.5% of bats in nature have rabies. 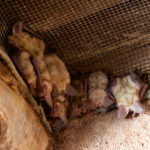 One of the most important things to keep in mind when dealing with bats outside your home is that they are a wild animal and should be left alone. Do not handle a sick or injured bat and if you observe one acting erratically, leave the area and contact your local health authority. If a single bat flies into your house and you are sure it has not had any contact with people or animals in your home, confine the bat to a room with an open window and give it some time to find its way out on its own. Swatting or chasing the bat will only cause it to panic and could increase your risk of being bitten or scratched. Capture the bat without risking further exposure, if possible. Always wear gloves and protective clothing and be very gentle as they are fragile animals. Clean any area that came in contact with the bat thoroughly with soap and water. Vaccinating your pets for rabies is not only required by most state laws, but it could also save your pet’s life in the event of a bat exposure. The National Association of State Public Health publishes guidelines each year that state if an animal that has not been vaccinated comes in contact with a potential carrier, the unvaccinated animal must be euthanized or kept in strict quarantine for six months. It’s a clear message: vaccinate your pets! Histoplasmosis is a respiratory infection transmitted by breathing airborne spores of a fungus found in bat guano (droppings). It is rare in New England, but common in other areas in the United States, such as those surrounding the Mississippi and Ohio River valleys. The symptoms vary, but often are similar to the flu. In many cases, the disease runs its course. However, it can become severe or fatal if left untreated, particularly for those with weakened immune systems. 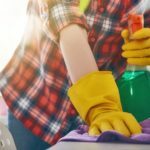 Certain activities could increase your risk of being infected with histoplasmosis by potentially putting you in contact with accumulated bat droppings. 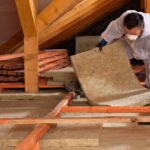 These include cleaning or remodeling old barns and buildings, exploring caves, cleaning your attic, or digging in soil where guano is present. If you are working in an area where guano could be present, make sure to wear a face mask to reduce your risk of inhaling spores. Large amounts of droppings should be cleaned up by the experts, such as a Modern Pest Services Wildlife professional. The two most common bat species in New England (the little brown bat and the big brown bat) both tend to choose buildings as their roost sites. This could be an old barn, an abandoned warehouse, or in some instances your attic! 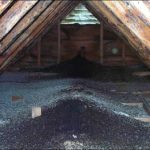 Unlike rodents or other wildlife, bats themselves are not known to cause major structural damage to your home but their accumulated droppings can. Guano can stain your ceiling or walls, damage your insulation. Depending on your home’s layout, it could even contaminate your water. There are also the health risks associated with guano accumulation, like histoplasmosis. Many homeowners with bats roosting in their attic are bothered by the strong musky smell. Since bats are nocturnal, their squeaking and fluttering can also result in interrupted sleep. 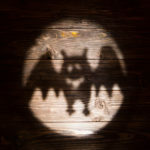 RELATED: Bats in the Belfry – How to get them OUT! When dealing with roosting bats in your home, it is essential to seek expert advice. The Endangered Species Act protects many bat species in New England, and particular steps and considerations must be taken for their removal. At Modern Pest Services, our Wildlife division offers a wide range of services to take care of the problem from start to finish humanely. Our team has the knowledge necessary to effectively and humanely exclude bats from your home. We can help to locate and repair entry points, as well as clean up the mess left behind. So before they drive you absolutely batty (pun intended), give us a call 1-800-323-PEST and contact us to request a FREE wildlife inspection!